The number of people in Africa receiving antiretroviral treatment increased from less than 1 million to 7.1 million over seven years, according to a United Nations report which documents the progress in the AIDS response in the world’s second largest continent. “Africa has been relentless in its quest to turn the AIDS epidemic around,” said the Executive Director of the Joint UN Programme on HIV/AIDS (UNAIDS), Michel Sidibé. Antiretroviral treatment increased from less than 1 million in 2005 to 7.1 million in 2012, with nearly 1 million added in the last year alone. 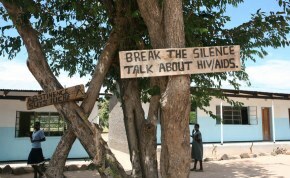 AIDS-related deaths were also reduced by 32 per cent from 2005 to 2011. The UNAIDS Update on Africa, which was released to coincide with the beginning of the African Union’s (AU) 21st summit in Addis Ababa, which began Sunday and runs through 27 May, attributes this success to strong leadership and shared responsibility in Africa and among the global community. It also urges sustained commitment to ensure Africa achieves zero new HIV infections, zero discrimination and zero AIDS-related deaths. “As we celebrate 50 years of African unity, let us also celebrate the achievements Africa has made in responding to HIV–and recommit to pushing forward so that future generations can grow up free from AIDS,” Mr. Sidibé said. The report states that 16 countries–Botswana, Ghana, Gambia, Gabon, Mauritius, Mozambique, Namibia, Rwanda, São Tomé and Principe, Seychelles, Sierra Leone, South Africa, Swaziland, Tanzania, Zambia, and Zimbabwe–now ensure that more than three-quarters of pregnant women living with HIV receive antiretroviral medicine to prevent transmission to their child. Despite positive trends, Africa continues to be more affected by HIV than any other region of the world, and accounts for 69 per cent of people living with HIV globally. In 2011 there were still 1.8 million new HIV infections across the continent, and 1.2 million people died of AIDS-related illnesses. In the report, entitled Update, Mr. Sidibé emphasizes that sustained attention to the AIDS response post-2015 will enhance progress on other global health priorities. He also identifies five lessons in the AIDS response that will improve the world’s approach to global health. These are: focusing on people, not diseases; leveraging the strength of culture and communities; building strong, accountable global heath institutions; mobilizing both domestic and international financial commitments; and elevating health as a force for social transformation. “These strategies have been fundamental to Africa’s success at halting and reversing the AIDS epidemic and will support the next 50 years of better health, across borders and across diseases,” he said. The report also stresses AU leadership is essential to reverse the epidemic. At this year’s Summit, AIDS Watch Africa, a platform for advocacy and accountability for the responses to AIDS, tuberculosis and malaria founded by African leaders in 2001, will review progress on health governance, financing, and access to quality medicines, among other areas, and measure whether national, regional, continental and global stakeholders have met their commitments. The AU, UNAIDS and the New Partnership for Africa’s Development (NEPAD) will also launch the first accountability report on the AU-G8 partnership, focusing on progress towards ending AIDS, Tuberculosis and Malaria in Africa. This entry was posted in Africa Healthcare, Antiretrovirals, HIV/AIDS and tagged Africa, Disability Aid Abroad, HIV/Aids, International Disability NGO, TB, UNAIDS on May 23, 2013 by disabilityaidabroad.